While it’s sad that Red Dead Redemption 2 still has not been confirmed for release on PC, despite the game’s incoming console launch in October (just two months away folks), PC owners of Grand Theft Auto 5 can get in on the pre-release hype by earning a special melee weapon in GTA Online – which can then be unlocked in RDR2. 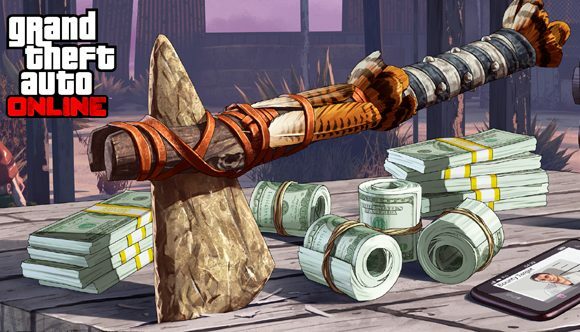 The Stone Hatchet can be earned by tracking down bounty hunter targets received from Maude via text message in-game. Completing a further Kills Challenge gives players a GTA$250,000 bonus and unlocks the Hatchet for use in the console versions of Red Dead Redemption 2, when they come out. This axe is actually the second Red Dead tie-in weapon for GTA Online. The first, the golden Double-Action Revolver, came out back in December and can still be picked up now if you haven’t done so already. It’s unlocked as part of a treasure hunt received through in-game emails. If you’re having trouble following the clues Reddit can help you get started. After you get the Revolver, completing a 50 headshot challenge will net you GTA$250,000 and unlock the golden gun for use in Red Dead Redemption 2. The Stone Hatchet has a similar unlock process, but tracking down bounties seems a little easier than following vague clues. It seems very likely that RDR2 will end up on PC at some point, with publisher Take-Two calling the PC a “very, very important” platform for them, mostly thanks to digital distribution. Don’t hold your breath for a quick release however, since Rockstar’s last title GTA5 took a year and a half to make it to PC. Hopefully there will be further GTA Online tie-in events for RDR2 we can join in on to ease the pain a little.